Well, maybe "hate" is unfair. Or perhaps "TV Tropes" is, when the site isn't really the object of my wrath. 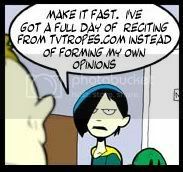 If you're unfamiliar with it, TVTropes.org is a wiki where people can enter the "tropes" they've seen in movies, TV shows, comics, webcomics, books, operas, or in fevered dreams. And what is a trope? A convention, idea or device often used by writers. But--the front page assures you--they do not want clichÃ©s. Right off the bat you may see the problem, as commonly used conventions, ideas and devices are at best clichÃ©s about to happen and at worst, well, clichÃ©d. But it's an interesting idea for a website and can be fun to spend some time on, looking around at stuff and finding all of the tropes associated with your favorite shows. No, the real issue I have is with what are deemed "Tropers." The obsessive, lifeless losers who seem to think reciting tropes somehow shows they "get" things, when in fact it shows the opposite. Once on another message board somebody made a joke that I remarked on, as I found it funny. Woe be to me, however, as this was just the sort of opening one of the festering pustule Tropers needed to spew his puss. "That is an example of the 'Banana, Banana, Grenade trope,'" he said, or something equally stupid. And then gave a link that explained the joke. Because, yes, that is exactly what everybody wants to read. There is nothing funnier than a joke that's been explained in wiki format. That's the quintessential example of the Troper. Normal users might read about some tropes, smile as they recognize other examples of them, and follow links to discover other shows or comics they might like. A Troper seems to believe his ability to recognize tropes somehow makes him into a literary theorist. It's like if someone walked into an art gallery and was able to name the colors used in the paintings. Are we supposed to be impressed? There's no insight, no depth, no actual understanding. All there is this is robot-like ability to slap labels on things. But, oh, they want to share their stupid labels with you so, so badly. And that is why I hate them. Fri, 01/07/2011 - 19:55 â€” What Exit?